Użytkownicy przyznają karamba punkty reputacji! thx very much guys sorrry for break, but i've just come back last training i had was week ago, but i think i'll do it tomorrow or on thursday i promise that i'm adding current training plan this weekend and finally how are you brothers and sisters ? 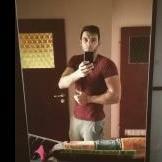 Current form 65kg / 180cm . what do u think ?